Enhance your visit to The Lakehouse Inn with our spa treatments. It’s the perfect way to relax and unwind during your stay. Try our Signature Cabernet Massage! Enjoy a 60-minute relaxation massage. Afterward, relax with a glass of wine and a cheese plate. This is a 60-minute massage to nurture the mother and child in the most relaxing way possible. We take extra care to ensure the mother’s comfort and safety. This massage uses Farmhouse Fresh products to leave your skin feeling hydrated and relieves back and hip pain, swelling in the limbs, and headaches. Only recommended after the first trimester and during a healthy pregnancy. *A physician’s note is required for this service to be performed. 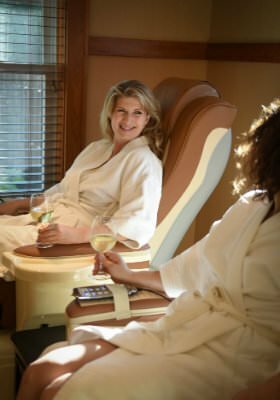 Try our Signature Stomping of the Grapes Spa Pedicure & Spa Manicure! The benefits of wine therapy results in softer skin from the extracts of crushed red wine-making grapes. Begin with a softening soak and a brisk exfoliation to soothe skin and clear away rough spots. Real honey and golden olive oil will condition and fortify the skin with our unique Tuscan Wine masque. Finish with a rich massage featuring a super antioxidant resveratrol serum blend made from Texas winery grapes! Top off with a solid coat of polish, a glass of wine and a small cheese plate for ultimate relaxation! The Spa at The Lakehouse Inn provides a private, calm setting where you can receive professional waxing services.